Domestic & Commercial Window Cleaners Seven Kings IG3 | Quality Property Care Ltd.
Do not miss the chance to finally get rid of the dangerous and long-lasting domestic and residential expert cleaning chore. Count on our professional window cleaning company! We would certainly be glad to assist you. Get in touch with our kind and helpful customer support representatives via this phone number 020 3746 4287 and get all the information you want right now! Dear clients, Quality Property Care Ltd. company totally guarantee you that your property or home is under safety. The crew we send to you is composed of covered and well-trained window cleaners. They are devoted, motivated and diligent. You are not even obliged to remain in the property in the course of window cleaning in Seven Kings IG3. All you need to do is to keep us some parking space, so the friendly professionals can park the van with the water fed pole product. In case of any omission, we handle the damages or re-do the treatment for free! Your final customer approval is certain. To clean your window on the outside we use a specific water fed pole system which is situated in our van (hence the need to the close proximity). The system takes regular tap water and removes the nonessential minerals from it leaving it a pure H2O compound. Mineral free the water is a lot lighter, with a larger mineral absorption property than just before. The cleaner is in the van, with the telescopic water fed pole cleaning windows from a distance. We do not use any sponges or detergents, just simple purified water which does not demand any rinsing. For inside window cleaning we utilize a standard setup of proper detergent and squeegee, including the drying and rinsing of the inside of the window. Thanks to the water fed cleaning process we are able of treating a wide range of window types - sun roofs, sash windows, big and small bay windows, big and small double windows, skylights, garden windows, French door panels and quite a lot more. Quality Property Care Ltd. is a highly rated window cleaning company in Seven Kings IG3. It was founded back 10 years ago. Through the years we have realized that customer`s satisfaction is the best value we have from our services. The domestic and commercial window cleaning service is one of our top achievements based on innovative strategy, fast speed and minimum danger for the customers and the window cleaners. We are offering a proper outside window cleaning for displays, big bay windows, for shops, garden windows, domestic buildings up to 4 stories in height, conservatories and even gutters and patios. If you have a shop on a busy street and want that window cleaned, we can support your needs, no hassle or extra fees. We deliver our own devices, fully set to tackle any spot or window cleaning situation that you would like resolved. We bring ladders, gloves, detergents, towels dirt extractors, squeegees, vacuum , telescopic poles for the squeegee and some filtered water. To maintain the inside of your property or home clean, our staff uses overshoes to reduce the dirt exposure of the windows. Based on the spots in question, we use a detergent or simple water . Sometimes a wipe down with a micro fiber towel to eliminate fingerprints is sufficient. This is performed using our water purification system connected to a water fed pole. The whole system sits compactly in the van, allowing for flexibility. A water purifier strips standard tap water off of its minerals and other chemicals, leaving it a bare H2O compound. This form of water is known as purified water, it links a lot more quickly to dirt and grime due to its denaturalized state. There is no trick, no smoke and mirrors, no tricks, only simple pure tap water eliminating accumulated dirt and grime form your windows. Our cleaner starts from top to bottom, initiating with proper window frame and sill cleaning to removing any grit and debris, then he moves onto the glass itself. If the day is particularly windy we hand dry the window with cloths to stop further saturation. 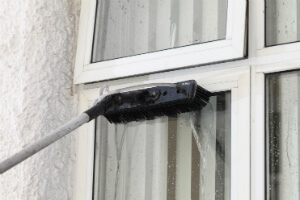 To book the windows cleaning service, just phone 020 3746 4287 or send an online booking request immediately. The client care service is available, so you will get a written confirmation as quickly as possible. Same day cleaning service is available, and so is cleaning on bank holidays or weekends, with no additional price. No down payment is needed for booking, and big deals are offered for booking combined cleaning and maintenance services.